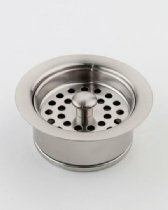 Disp Flange Strainer, Black Nickel. This item is used for Rough Plumbing, Garbage Disposers. The item is manufactured in United States.